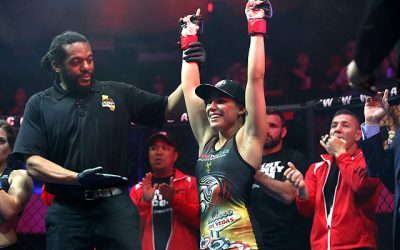 Following a magnitude of production for Bellator 142: Dynamite 1, Bellator goes back to a pure MMA event with Bellator 143 in Hidalgo, Texas, at the State Farm Arena. The event houses a four-fight main card with another 10 bouts on the preliminary portion of the card. 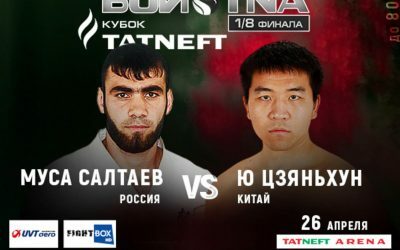 There are no titles on the line or one-night tournaments on this card, but the headliner could provide the next title shot in the bantamweight division. 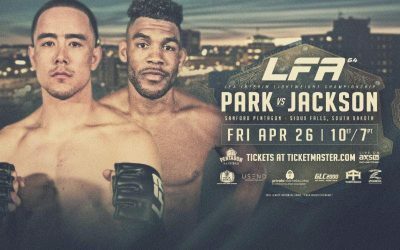 It pits former Bellator champion Joe Warren against L.C. Davis. Davis is coming off a “Fight of the Year” candidate against Hideo Tokoro at Bellator 135 that really put Davis on the map as a legitimate threat for the title in the bantamweight division. Warren is coming off a loss in the first defense of his bantamweight title against Marcos Galvao. Warren lost the fight by verbal submission. In the co-main event, UFC veterans Joey Beltran and Kendall Grove fight in the middleweight division. Both fighters are looking to get back into title contention and earn another shot at Bellator gold. 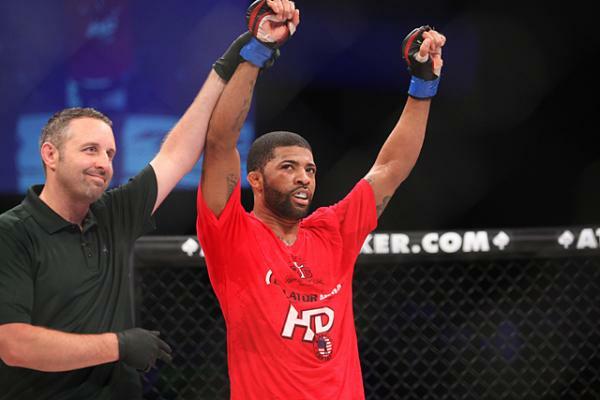 Grove is coming off a title-fight loss to Brandon Halsey at Bellator 137. Beltran is coming off a majority decision victory over Brian Rogers at Bellator 136. The final two fights on the main card reside in the featherweight and heavyweight divisions. At featherweight, prospect Henry Corrales takes on Emmanuel Sanchez. At heavyweight, kickboxer Ewerton Teixeira makes his Bellator debut against Vinicius “Spartan” Queiroz. The Bellator preliminary card begins on Spike.com and Bellator.com at 7 p.m. ET. 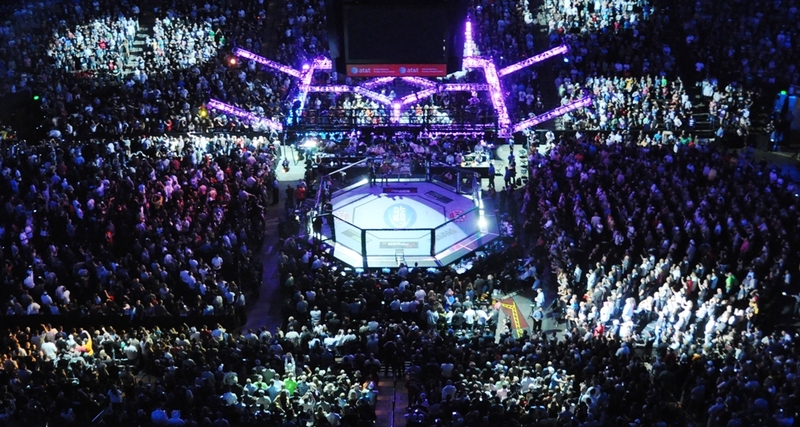 The main-card action begins on Spike TV at 9 p.m. ET. Bellator’s company man, Joe Warren, returns to the cage following his loss to Marcos Galvao for the bantamweight title. Warren lost by verbal submission, an outcome that Warren has vehemently debated. Warren is a strong wrestler and possesses a good set of grappling skills. His chin is questionable, especially when factoring in his age and the knockouts he has suffered over the years, most notably against Pat Curran. Warren isn’t going to beat anybody on the feet. Instead, he chooses to beat fighters on the mat. His game plan is just that simple. 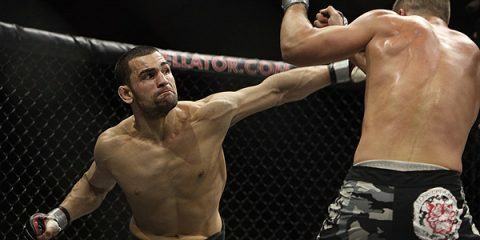 He uses the striking to set up takedowns and bring the fight to the canvas as quickly as possible. L.C. Davis is coming off of what is arguably the “Fight of the Year” against Hideo Tokoro. It was an absolutely amazing fight, and Davis deserves huge props for putting on a show and coming out with the victory. Davis is a wrestler who can win fights on the ground. Davis should give Warren a tough time in bringing the fight to the ground. While only eight of his 22 career victories came by knockout, Davis does possess power in his striking and could very well end the fight early if he connects. Davis is having such a great career resurgence. This fight is going to set up the winner with a title shot at bantamweight most likely. Davis keeps this fight off the ground and, following his great showing against Tokoro, continues his resurgence with a second-round TKO victory. Who could have seen a Joey Beltran and Kendall Grove middleweight clash being the co-main event five years ago? If you said “I did,” then you’re a liar. Both fighters have had title shots in their Bellator careers, and both of those shots went pretty poorly overall. 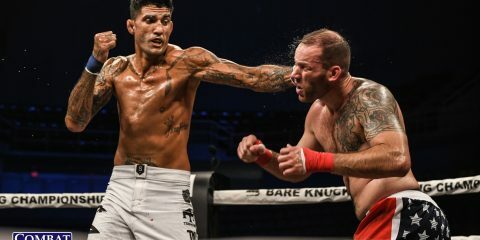 Beltran was dominated in a one-sided match against Emanuel Newton at light heavyweight, while Grove’s title loss came in a lopsided affair where he suffered a TKO at the hands of Brandon Halsey. Beltran and Grove have been equally good in Bellator. Grove’s two losses came against solid Bellator veterans in Brett Cooper and the aforementioned Halsey. Meanwhile, Grove has beaten former Bellator champion Christian M’Pumbu and Joe Vedepo. Beltran has defeated Vladimir Matyushenko and Brett Rogers while losing to the aforementioned Newton and Quinton “Rampage” Jackson. Beltran is going to want to keep this fight on the feet and make it a brawl against Grove. Grove will enjoy a four-inch reach advantage against Beltran, who should look to close the distance and make this dirty against Grove to take away that advantage. Beltran should also avoid taking this fight to the ground, where Grove’s long limbs give him an excellent ability to utilize the rubber guard and secure easier submissions off his back. Of course, Grove should look to execute the opposite game plan by seeking to take the fight to the mat and keep Beltran at distance on the feet. Grove takes this fight with a better ground game and the reach advantage. The fight will go the distance and result in a unanimous decision victory for Grove as Beltran fades over three rounds. 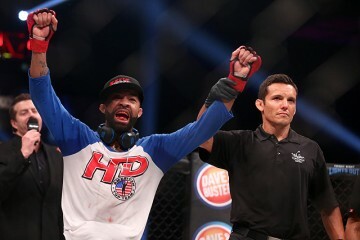 Henry Corrales and Emmanuel Sanchez are coming off of losses against the top of the Bellator featherweight division. Corrales suffered his defeat courtesy of former Bellator champion Daniel Straus. Sanchez lost to another former Bellator champion, Pat Curran. Corrales is a pretty well-rounded prospect. The 29-year-old had a dominant run for King of the Cage and has amassed 10 stoppage victories in his career. It was a stretch to ask him to beat someone like Straus in just his first Bellator fight. Sanchez is definitely a more manageable opponent and a great setup to get Corrales back in the win column following his first loss. While Sanchez may be a big step down from Straus, he is another good prospect in the featherweight division. Sanchez has submitted five of his opponents. The Roufusport fighter is going to have the striking to back up Corrales and set up the submission game. The 25-year-old took Curran to the judges, but lost the battle by unanimous decision. 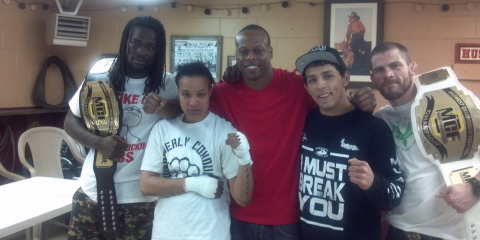 However, Sanchez took the fight on short notice. He had some success early by applying heavy pressure on Curran. 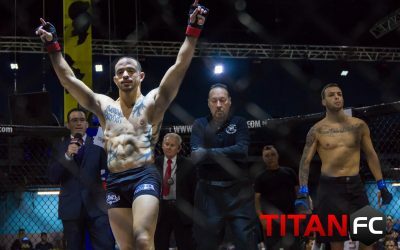 Sanchez couldn’t overcome Curran’s superior striking and wrestling, but it was yet another case of a fighter getting more than he could handle in his promotional debut. 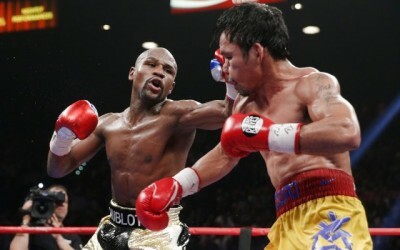 This should be a close fight between two equally adept fighters. The dominance that Corrales displayed in his King of the Cage run is hard to overlook. In a fight where picking the winner is extremely difficult, the edge goes to Corrales. Ewerton Teixeira makes his Bellator debut and returns to the cage for the first time in two years. He’ll face Bellator heavyweight veteran Vinicius Queiroz. Teixeira’s game is relatively easy to break down and predict. He is a kickboxer who won the K-1 World Grand Prix 2008 in Fukuoka, Japan. He also holds wins over Jerome Le Banner and Errol Zimmerman in K-1. Teixeira is going to look to use his kickboxing skills in this fight. That is where he shines and it’ll be the difference between a win and a loss in this contest. Meanwhile, Teixeira’s ground game is a mystery. He needs to keep this fight off the mat if he wants to win. Queiroz hasn’t fought since he knocked out Lavar Johnson in 2013. That was a heavyweight tournament semifinal fight. Queiroz was expected to face Cheick Kongo in the finals, but a knee injury knocked him out of the tournament. 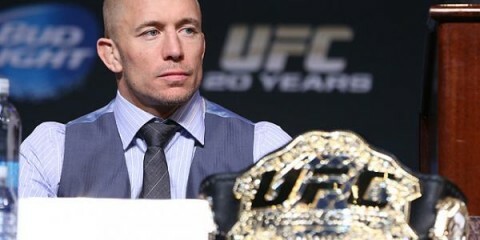 Both fighters have been both out of action for a couple of years, so they’ll likely be both facing the same ring rust. Queiroz is going to be a game opponent. The 32-year-old has some decent boxing skills, but he is kind of slow with his striking attack. That could be highly detrimental if he wants to stand with a kickboxer the caliber of Teixeira. Queiroz does possess a decent set of wrestling skills, which could be the x-factor here if he decides to use them and put Teixeira on his back. Queiroz could look for the takedown, but his efforts will be too little, too late. Teixeira will already be in control and well on his way to securing a TKO victory.